All over the city, top-quality drinking water flows out of fountains both big and small – and free of charge for everyone. Amazon Fountain at Rennweg: first mentioned around 1430. Decorated with a female figure, it is one of the first of Zurich’s fountains that is also regarded as a public work of art. Alfred Escher Fountain at the Main Train Station: in operation since 1889. The figure of Alfred Escher stands at the top of a triangle, which links his most significant achievements: as a railroad pioneer he ensured that, with its train station, Zurich established itself early on as one of the most important transportation hubs in Switzerland. In addition, Escher was involved in the founding of what is today the Swiss Federal Institute of Technology and the Schweizerische Kreditanstalt (the present-day Credit Suisse) at Paradeplatz. Lindenhof Fountain on the Lindenhof: in operation since 1667. 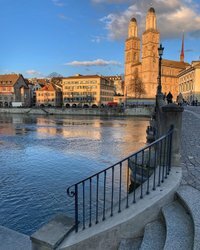 The present-day fountain was erected in 1912 to commemorate the brave women of Zurich who in 1292, dressed in full battle gear, scared away an Austrian army and thus prevented the city from being besieged. Those who get thirsty while exploring Zurich do not need to look for a supermarket. A drinking bottle is enough – such as the top-quality, reusable, and ultra-light Sigg bottle that can be bought at the Tourist Information. Simply unscrew, fill up, and enjoy the cool, fresh drinking water. 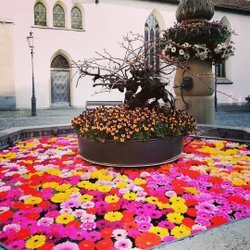 Anyone interested in finding out more about Zurich’s innumerable fountains can book the city tour, “Water in Zurich”. This map shows where the various fountains are located in the city of Zurich. 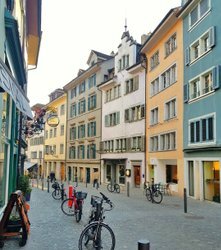 City tour to the fountains, rivers and the lake – a snapshot of Zurich´s excellent quality of life. See how the experts cleans tons of cubic meter of sewage water.